February 9, 2011: Simon Brewer documented a strong snowstorm in central and northern Oklahoma. This was the last, so far, big snowstorm for Oklahoma this winter. This storm was special, because it setup an environment, which would break record low temperatures all over the state including the all time record low temperature. The storm dropped over a foot of powdery wind blown snow over many areas in northern Oklahoma. The following night, February 10th, the temperature plummeted over the new snowpack as a very dry airmass moved over the area setting an all-time-record low temperature for Oklahoma near Nowata, OK at -31 deg F.
I spent a majority of the event in Norman, OK, which was on the southern end of the storm. The snow started late, but was intense; most of the 4-5 inches fell in only a few hours and was blown by high winds. The temperatures were very cold (teens) making the snow very fine and powdery; definitely not a typical snowstorm for Oklahoma. The picture on the right was taken east of Billings, OK showing snow drifts on the side of highway 15. I only shot footage during the snowstorm, but I wanted to see the aftermath further north. I left Norman in the afternoon and drove north towards Blackwell, OK. I stopped a few times and shot some footage and only took a few stills. The picture on the right was taken east of Billings, OK showing snow drifts and formations. The picture on the right was taken near Perry, OK at sunset. The temperatures rapidly dropped after the sunset; I felt remarkably colder around this time and made my way back to Norman. 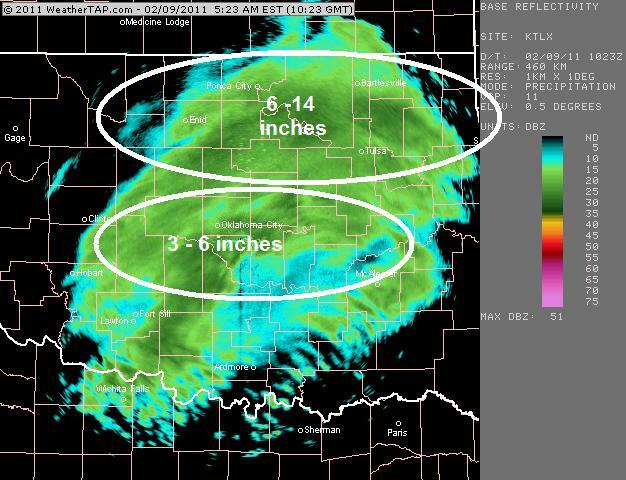 The image on the right is a radar base reflectivity image during the peak of the snowstorm; the heaviest snow fell over northern Oklahoma. The Image on the right shows a surface analysis for the early morning hours of February 10th with the surface high over Oklahoma. 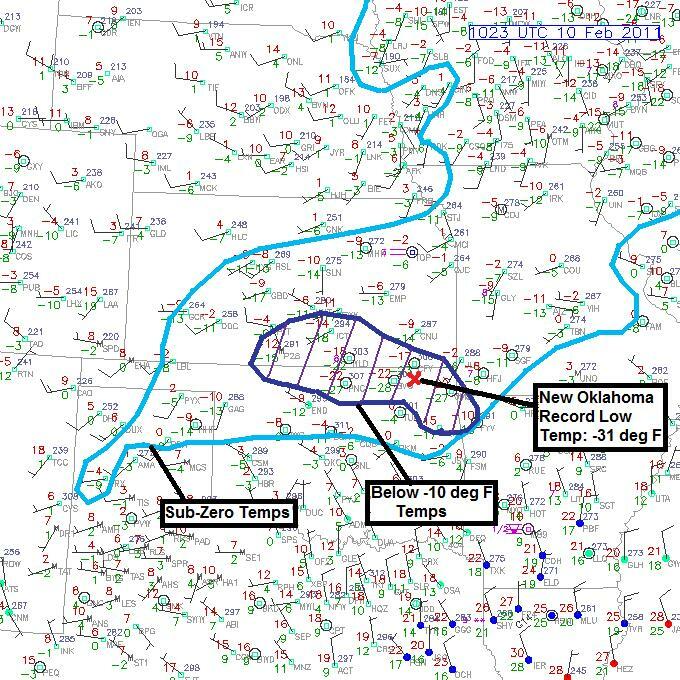 The image on the right is a surface map analysis on the 10th showing the localized area of very cold temperatures over the deep snowpack over the Kansas/Oklahoma border. 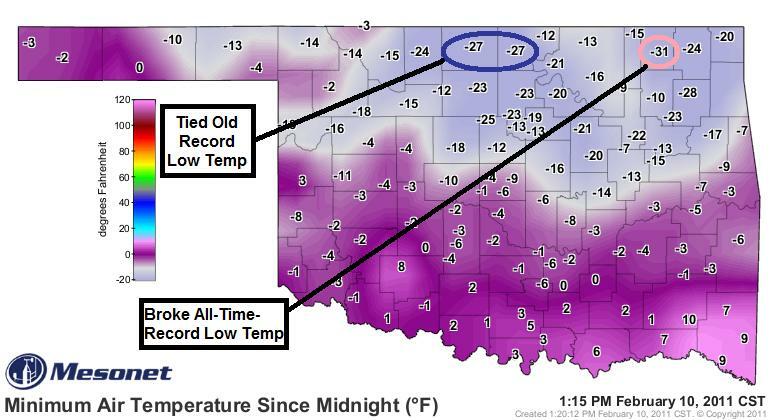 The image on the right shows the low temperatures for February 10th on the Oklahoma Mesonet; two stations in Northcentral Oklahoma tied the all-time-record low temperature at -27 deg F, while a station near Nowata, OK shattered the record at an amazing -31 deg F! 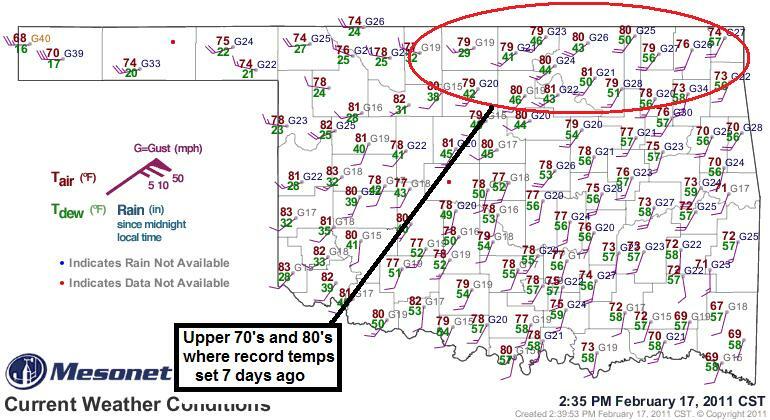 This is not evidence against the theory of Global Warming; local temperatures are not reflective of the entire planet, the airmass didn't break any records north of Oklahoma, and record warm temperatures were broken over the same areas only a week later. The image on the right is an Oklahoma Mesonet map showing abnormally high (record highs in some areas) surface temperatures across Oklahoma. 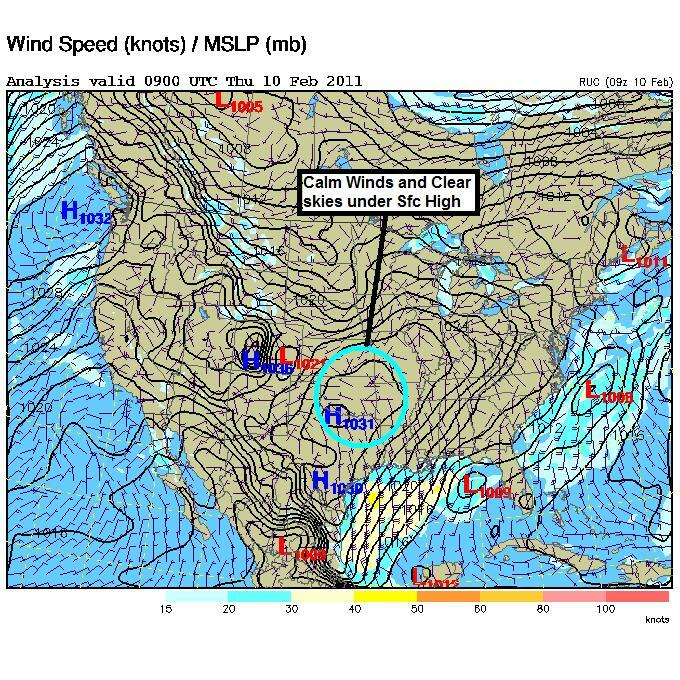 Amazing to think it was 79 deg F over Nowata, OK when it was only -31 deg F 7 days earlier; a 110 deg F difference!